The light bulb. The telephone. Experiential marketing. Yep, all inventions of the late 1800’s. Our industry has come a long way since the first activation: a literal train wreck hosted by the Missouri-Kansas-Texas Railroad in 1896. In spite of the fact that the train cars exploded on contact and shrapnel injured spectators, the event was deemed a success. A delighted crowd took photos with the wreckage. Train ticket sales increased. Today, the effectiveness of experiences in engaging audiences remains unchanged. But that’s about the only thing. As technology, connectivity and creativity continue to evolve, we face the challenge of making innovation work for us rather than against us. How can we enhance experiences without fragmenting a consumer’s already divided attention? These four tech trends can work to your brand’s benefit. Brands can deliver a new dimension of experience to customers through the use of augmented and virtual reality. But what’s the difference between them? Augmented reality layers digital imagery and information on top of a user’s existing reality. It adds new stimulus to what’s right in front of you. Pokémon Go! brought AR into the mainstream and remains an illustrative example. In the game, digital images of Pokémon are “placed” in public spaces. Players must look through a camera-enabled mobile phone in order to see the Pokémon. When a player’s location matches that of a Pokémon, the creature appears on the screen within the user’s real surroundings. Players then “catch” the Pokémon, thus achieving the objective of the game. Pokémon Go! 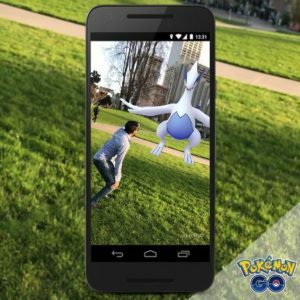 brought augmented reality into the mainstream in 2016. The tech trend has since caught on like wildfire. AR is now becoming increasingly popular in retail environments, allowing customers a new way to try before they buy. While AR maintains a user’s existing environment, virtual reality replaces it. 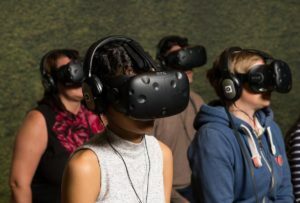 Virtual reality simulates a new scene for the user, one that resembles a real-life environment unique from the one their in. At the Wimbledon Lawn Tennis Museum, part of the visit includes a VR experience. You sit down, put on a headset and are soon standing on Centre Court. Every direction you turn offers a new view. Above, birds fly through blue skies. Behind you sits the Queen in the Royal Box. Straight ahead stand the net and your opponent. You get a sense of what it might be like to receive a serve from some of today’s tennis greats. It’s an incredible and terrifying experience. Leading museums aren’t the only ones making virtual reality work for them. The auto and tourism industries have eagerly embraced VR. Imagine being able to drive a car without leaving the showroom floor or visiting an island from your couch. The possibilities are endless. See, smell, taste, TOUCH. Born out of gaming, haptic technology emits vibrations to heighten the sensory effect of an experience. You may already own a device that gives feedback in the form of a snap, shake or rumble, but experts expect haptics to be increasingly integrated into ads – particularly those of the mobile variety. The results for early adopters have been positive. According to a recent study, adding haptics boosted consumers’ excitement levels by 8 percent. Can’t make it? No problem. More and more, brands are providing access to experiences through live video. Although the broadcasts don’t always net massive numbers at airtime, they ignite social conversations and drive future views. Pre-promotion is the key to success. Brands must give their audience a compelling reason to watch. They also need to tell them when to tune in. Nike’s attempt to break the two-hour marathon brilliantly illustrates the power of live video to amplify an event. Facebook’s recent algorithm shift further incentivizes the use of live video. Facebook Live videos now experience three times the engagement of regular video. They also trigger notifications that ping fans and followers. There’s never been a better time to jump on the bandwagon. These innovations are just some of the ways marketers are pioneering more immersive brand experiences. But be mindful not to get too distracted by the new shiny thing. If technology compromises the integrity of your experience, you risk a different kind of train wreck. Originally published June 21, 2017.